Wayne Brough, the Chief Economist and Vice President of Research at FreedomWorks, has decided to make himself available for weekly Q&A sessions. Each week we’ll post the questions we receive and detailed answers to them. We welcome supporters and opponents alike to send in any questions they have about the free market, economic history, or public policy, and we’ll do our best to answer everything to completion. One of the most common e-mails we see: “Is Barack Obama’s recovery plan working?” We’ve answered that question below with 10 easy-to-read charts. And don’t worry — future Q&A’s will be more diverse and will encompass both graphics and longer explanations. Send questions to OfficeHours@freedomworks.org, or tweet them to us at @freedomworks! 1.3 million Americans have lost their jobs since Obama took office in January 2009. 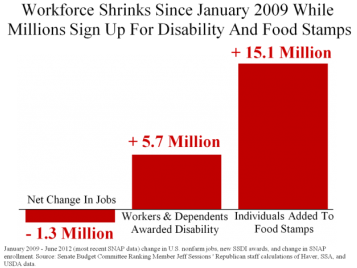 In that same period of time, 15.1 million Americans signed up for food stamps. Annual healthcare premiums are now $5,000 higher than Obama promised they’d be. Christina Romer, the former Chair of Obama’s Council of Economic Advisers, warned that unemployment would skyrocket without the stimulus package. The administration spent $278,000 for each job ‘created/saved.’ Yet real unemployment — represented by black dots — is now even higher than their worst-case-scenario predictions. Gasoline prices aren’t actually rising. The purchasing power of the US dollar is in free-fall, though, and that’s why we keeping paying more at the pump. Obscene deficits and unfunded liabilities have driven investors away from our currency. This is one reason Iran began to seek oil payments in the Japanese yen. In 2010, General Motors’ Chairman and CEO Ed Whitacre starred in a misleading commercial in which he claimed, “I’m here to announce we’ve repaid our government loan — in full, with interest, five years ahead of the original schedule.” However, they ‘paid back’ this loan with other bailout monies. The government still owns about 26 percent of GM, too, stock that (1) it needs to sell at $53.00 per share in order to break even and (2) closed this week at $23.68 per share. The Youth Misery Index has jumped 26 percent under the Obama administration.10 The Department of Education continues to inflate tuition costs with the help of financial aid packages and excessive Pell grants, and, as of July 2012, the youth unemployment rate stood at a dismal 17.1 percent. When isolated for African-Americans, it reaches 28.6 percent. The median household income has fallen 8.2 percent since Obama took office. The figure, which was $55,198 at the beginning of his term, dropped to $50,678 as of August 2012. The national debt eclipsed $16 trillion in September 2012 after having risen by $5.4 trillion under the Obama administration. Keynesians are jumping for joy that the unemployment rate fell below 8 percent for the first time since Obama took office. In other words, unemployment is the same as it was when he took office: 7.8 percent. And this doesn’t include persons who have stopped looking for work, who are statistically underemployed, et cetera. The government’s “official” (U-3) unemployment rate is the green line; the real (U-6) unemployment rate is the red line. A few standard economic indicators, courtesy of White House records. That concludes our first "Office Hours." As a reminder, feel free to send your own questions to OfficeHours@freedomworks.org, or tweet them to us at @freedomworks! I have a question. Keynesians often argue that supply side economics do not work. That we have tried and failed to produce evidence of that. What is their major argument against trickle down economics, and what is their evidence that it doesn't work. If you can find hard, fast, historic examples that would be nice. As well, what is the evidence that supply side economics works? Brian, I forgot, please try to put this type information in a PDF also so we can print it out. I had the Clancy Obamacare PDF printed out in a 24 x 18 size poster and take it everywhere I go and show it at every opportunity so people know how many government agencies are involved in Obamacare and it really makes a huge impression. Please keep it coming. Everyone can understand charts, Ross Perot almost won an election using simple charts and "would have" won it had he really wanted it. Most people don't have the time or tenacity to understand all of the data associated with this data but Simple Charts are powerful for the average person. Romney should have this type stuff as part of his everyday arsenal. Thanks and keep it up.